To describe Porteau Cove on British Columbia's west coast as stunningly beautiful is to do it a disservice. It's the kind of place that mostly shows up on tourist post cards. Words like beautiful don't even begin to describe it -- a deep blue fjord surrounded by dark green heavily forested mountains, topped with a frosting of snow. I've arrived here to test out some new diving gear: specifically a new dry suit. I've finally given in and spent the money to buy the suit of my dreams. It's a custom fit Santi Emotion, with all the bells and whistles. Regardless of how great the suit is in theory, I still have to check out how it works in a relatively sheltered area. 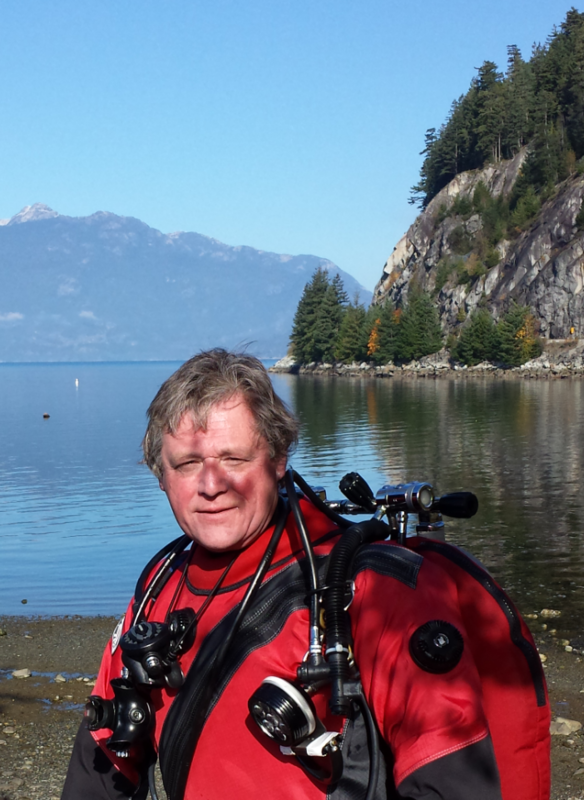 So I'm here with the folks from International Diving Centre in Vancouver for what's called a fun dive. It's a convenient way to explore the West Coast for me. I'm relatively new to the area. A fun dive includes a Dive Master, Kevin, a buddy and the ability to just follow the crowd and concentrate on how the gear is working. I've done this a couple of times since moving temporarily to British Columbia and its worked out just great. But there's some kind of cosmic karma at work today as I set out from my apartment in Vancouver. The city is socked by a brutal stretch of fog, we haven't seen the sun for weeks. So the first golden moment comes as I round the bend from Horseshoe Bay and head up the coast towards Squamish. The minute I start driving North, the fog clears and the sun emerges revealing an absolutely stunning clear day. I relax in my car and enjoy a spectacular drive up the "Sea to Sky" highway between Vancouver and Squamish. The second moment of extreme gratification comes when I start to gear up. I slip into the new suit and it fits like the proverbial glove. Normally I feel as if I'm putting on armour when I wear a dry suit. But the Santi is like sliding into a wet suit. I still have amazing flexibility. It's comfortable and functional. Everything I've ever wanted in a dry suit. People had always told me that I had to spend the money for a custom fit suit -- I'd balked, but now I get it. 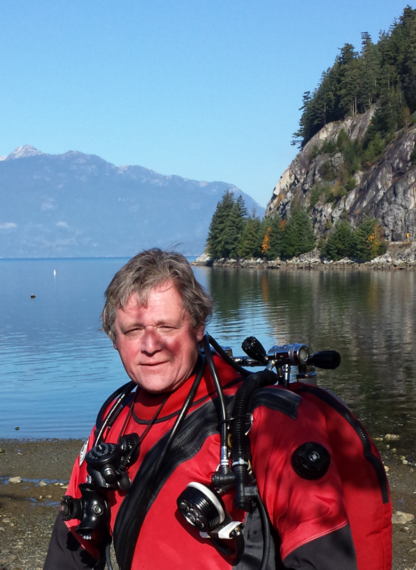 The third moment comes when I hit the water and after a rather long surface swim descend to explore Porteau Cove. The visibility is tolerably decent but what really delights me is the abundance of sea life. As a Great Lakes diver I'm used to spending a long time underwater and rarely seeing another living creature -- other than zebra muscles and gobies. So I'm somewhat wonderstruck by the richness of the life in Porteau Cove. For a start there are dozens of rather large Ling Cod just hanging around, completely indifferent to the divers swimming by. When I say rather large, I mean large -- up the three feet long and massive through the body. They let you swim within inches before flicking a lazy tail and almost indifferently swimming off. Copper Rockfish flick in and out of the artificial reefs that have been put into the bay for divers to explore and the old wrecks themselves are covered with small decorator crabs. All you have to do is stop and look for a moment and you can spot them hiding all over the reef. I also spot tiny shrimp by using the same stop and look method -- no bigger than half the size of a finger nail and almost translucent. At one point I swim through a large school of what appear to be tiny needle like fish. I have no idea what they were but they remind me vaguely of smaller versions of tropical pipe fish. And of course the whole underwater landscape is covered with massive numbers of white plumose anemones and star fish. It's a richness of biodiversity that rivals tropical reefs I've explore in the past. I surface with a certain amount of resentment that I can't stay down longer. It's times like this that I begin to wonder whether switching to a rebreather might be a good idea. 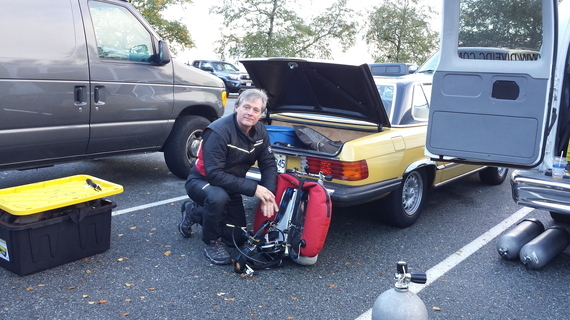 I wait impatiently through a surface interval then I'm back in the water for another magic dive. It's like a mirror image of the first one, filled with constant delights. By the time I'm done for the day I begin to realize that something rather special has happened. I've been given a gift. A perfect day. Everything has gone right. The weather was warm and sunny. The place I'm diving in could be part of tourist brochure. My new Santi dry suit has put a whole new meaning on the word easy. I've just been allowed to explore a world full of fascinating life. It's a collection of great moments that makes me stop and think. Life is full of difficulties. There are days at work when I feel like Sisyphus doomed to push a rock up the hill only to watch it roll back down at the end of the day. There have been stretches of adversity in my life in the last year that kept me awake night after night unable to sleep due to anxiety. I've worried about my family and their health, I've stressed over financial issues. There have been times when I've thought that I'm stretched to the breaking point. And then I'm handed a gift of a perfect day and life seems to drop back into perspective. And maybe that's what life is all about. Enjoying those moments of perfection that balance out all the other adversity that has to be dealt with. Certainly Ernest Hemingway seemed to believe, in an existentialist kind of way, that seeking those moments of perfection was the best that life had to offer. As for me, I'm still not certain what life's all about. But I will take the gift I've just been given and store it away in a special place and bring it out again when life throws a few more curves at me.